The Galway Tent Blog: Chart & Cancer Image Submitted to EPA-Ireland Oral Hearing, April 2008. Chart & Cancer Image Submitted to EPA-Ireland Oral Hearing, April 2008. 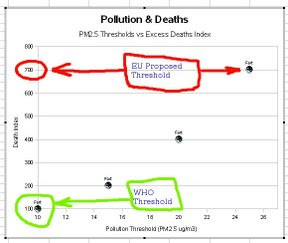 Chart Submitted to EPA-Ireland Oral Hearing, April 2008. Air Pollution Particles Inside Cancer Cells in Human Liver. EU Allows 25μg per cubic metre. WHO Urges 10μg per cubic metre. A reduction in the yearly average PM2.5 particulates to 15μg per cubic metre would result in life expectancy gains, at age 30, of between 1 month and 2 years. The US National Ambient Air Quality Standard for PM 2.5 particulates was introduced into the USA in 1997 with a mean annual limit of 15μg per cubic metre. This had measurable health benefits. California has a stricter limit of either 10μg or 12μg per cubic metre. The latest EU standard for PM 2.5 particulates is 25μg per cubic metre. An annual mean limit for PM 2.5 particulates is to be introduced into Scotland in 2010 and this will be 12μg per cubic metre. An annual mean target for PM 2.5 particulates is to be introduced into the UK in 2020 and this will be 25μg per cubic metre. Many will wonder why the difference is so vast when the science is the same.